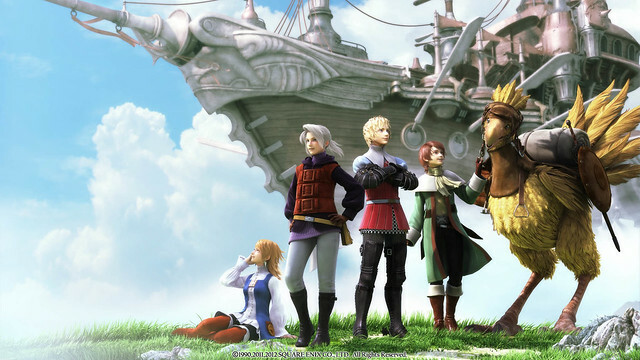 Square Enix has announced on the American PlayStation Blog that the PSP version of Final Fantasy III will hit PlayStation Network this Tuesday (25 September). This version is similair to the Nintendo DS and iOS version, but features a 16:9 screen, an image gallery and the option to switch to the original NES music and auto battle option. Let's hope an European release will be announced soon too. Update: It has been released on the European PlayStation Network on 26 September. Kingdom Hearts 1.5 HD ReMIX announced! During the opening of Square Enix's Tokyo Game Show booth the company has announced Kingdom Hearts 1.5 HD ReMIX for PlayStation 3 to celebrate the 10th anniversary of the Kingdom Hearts series. This HD collection will consist of three games: Kingdom Hearts: Final Mix (released in 2002 on PlayStation 2), Kingdom Hearts: Re:Chain of Memories (released in 2007 on PlayStation 2) and Kingdom Hearts: 358/2 Days (released on Nintendo DS in 2009), which will NOT be the full game, only the cutscenes. Next to the HD upscaling, the collection will also feature trophy support. The collection will be released somewhere in 2013 in Japan. No word about a western release. Additionally to this Square Enix has also announced an online browser game with the work title Kingdom Hearts for PC browser. Square Enix has launched their website and announced its line-up for the Tokyo Game Show 2012 that will be taking place from 20 till 23 September. A lot of games listed are Japanese only and only three games are playable. And again no Final Fantasy Versus XIII this year. On the Final Fantasy 25th Anniversary event, that took place last weekend, Shinji Hashimoto said that this year there won't be anything new regarding this game. During the first presentation on the Final Fantasy 25th Anniversary event a new game has been announced by director Motomu Toriyama: Lightning Returns: Final Fantasy XIII. This game marks the conclusion of Lightning's saga and will be released on PlayStation 3 and Xbox 360 in 2013. The game takes place 13 days before the end of the world on Novus Partus, which consists of 4 islands that are connected with a monorail. Lightning will return as a playable character who has to plan carefully what her actions should be, since they will have effect on the doomsday clock. Players will be able to be able to customise Lightning's looks, actions and abilities with a large range of different outfits and weapons. A key element of the game is that it will be "World Driven". There will be day and nights effects and maybe even have the four different seasons we experience ourselves. The game will also have interactions with Facebook. More details of the game will be revealed on 4 September. You can watch the presentation and three artwork images of the game below.